If Carl Froch, who officially opened SaltBox, had turned up on the evening I was there he would have increased the number of people having food by 50%. This surprised me, not that the former boxing world champion didn’t turn up, but that it was so quiet. 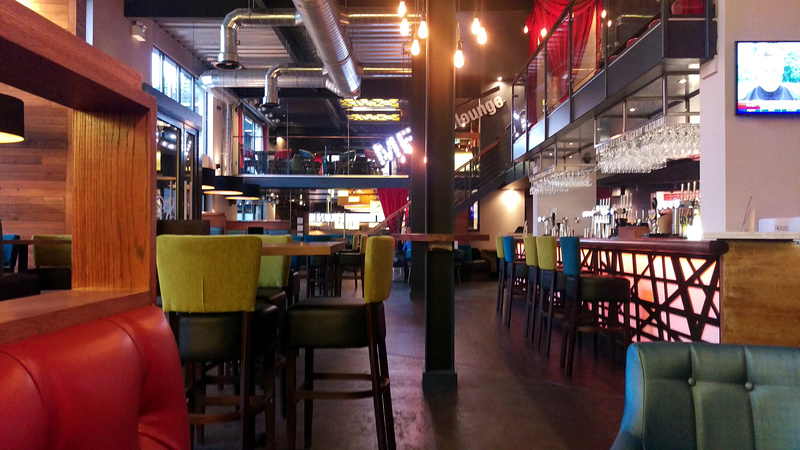 The “£1m redevelopment” of the bar / restaurant arrived to no little fanfare but whilst the likes of Belgo and other restaurants are packed the tumbleweed scuttles across the floors of Saltbox. Part of the lack of atmosphere is due to the size of establishment, it is doubled levelled and has a vast open area at the bar. This plays well for packing in the punters before a big arena show but not to an intimate meal at other times. We were invited to sit where we liked, only to be suggested to move as we were sitting above a drain that often produced a smell. Not a good start. The menu rivals the size of their restaurant with “specials”, pastas and grills each with a long list of their own. Starters were a tediously boring selection that didn’t get any juices flowing. A few odd items that stood out, but not necessarily for good reasons, the ‘Asiana’ board for example as there was nothing remotely Asian on the rest of the menu. 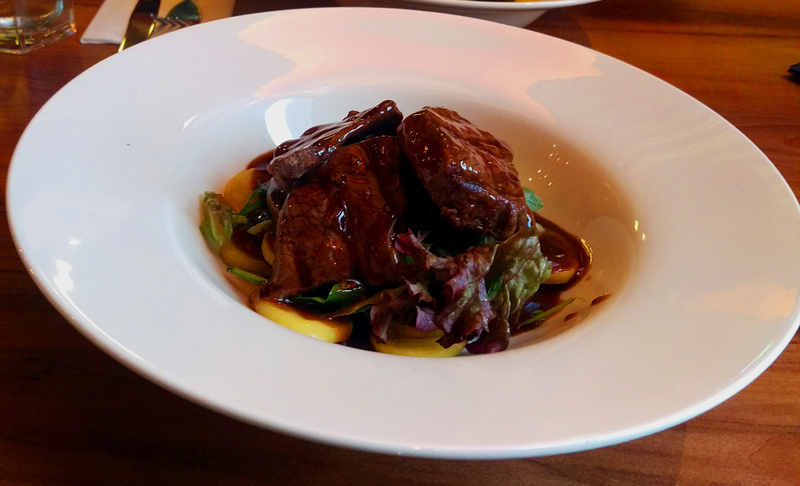 I went straight to the main course and to venison that often tempts me on a menu. It arrived in some gravy and non-descript hunks, I would have preferred one larger piece that had the opportunity to be pink. It was also strange that every main course in the specials had the same accompaniments. My dining partner’s swordfish came with sautéed potatoes (that she said reminded her of school dinners) and salad garnish. This meant that my venison and its gravy was mixed in with some lettuce leaves, weird. We also went for a side salad that we sent back as it appeared to have been sitting around in a hot kitchen for some time, listless and brown around the edges. They presented us with a new one with no fuss and took the other off the bill so kudos on handling that well. As starters had fallen by the wayside I thought I better try a dessert. 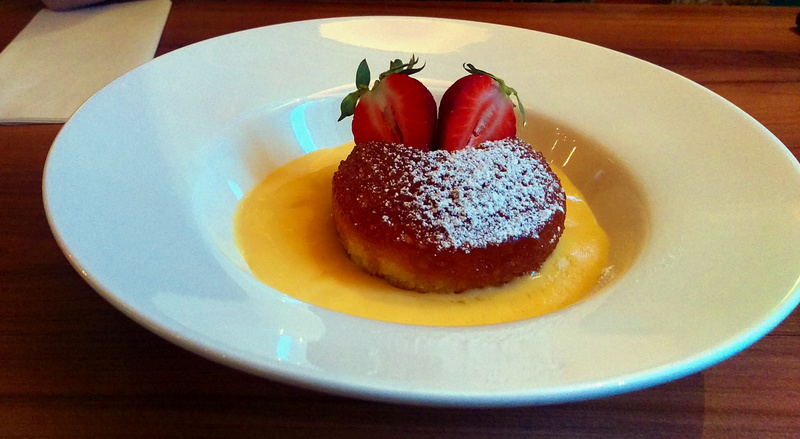 Treacle sponge pudding won out over a pannacotta when I discovered the latter was served in a martini glass, that’s cheating in my book! The suspicions of use of a microwave arose when it arrived though I had been assured it was home made. A passable mound of sweetness I suppose, custard was pretty basic, more yellow than is ideal. £16 for my vension main course is just too much for the quality of what arrived on the plate. At that price SaltBox is competing with the most expensive places in Nottingham. It competes with them very unfavourably. For £1 more you could have had the stunning Guinea Fowl dish I enjoyed at Hart’s. I could also list restaurants are significantly better value but we would be here a while. Clearly they will be making a lot of money when there is a show on given its proximity to the arena. I would still pop in for a drink as the beer options were actually good for a more commercial place, I enjoyed a Sierra Nevada this evening. Sadly, I can’t recommend anyone to come here for food though, outside of event traffic I don’t see who this would appeal to. Certainly not me. Great review as ever but I think your scoring is just too generous. 5/10 overall tells me that it’s a solid acceptable performance. It didn’t sound so. I think you could help your followers by being more differentiating in your scores. Interesting comments, seems a shame as the interior is really quite attractive. I tried a sample of the fish platter when I went there before it officially opened. Alarm bells rang for me when they couldn’t tell me the ingredients of the “lobster” cocktail. I was tempted to go back to give it a full review, but after reading this I’m not sure I’ll bother!